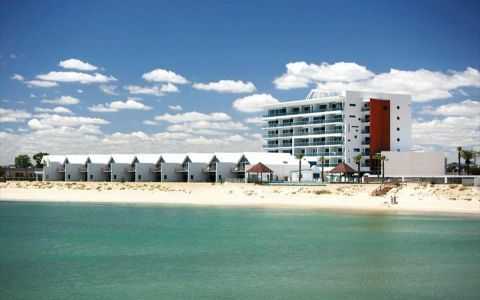 Aldemor Holiday Services WA offers short term holiday accommodation in Preston Beach, Falcon (Mandurah) and Falcon Bay Beach. We aim to find the most suitable accommodation for visitors to the Peel and the South West regions. Falcon Bay Beach, Falcon Estuary and Preston Beach book with Aldemor Holiday Services WA - a small locally based, family business managed by owner/operator Tracy Roache. Commencing in October 2016, AHS continues to offer an honest, friendly and reliable approach to holidaying in Preston Beach and other areas around the Peel and the South West regions of WA. Predominantly operating in Preston Beach, Falcon Bay Beach and Falcon, Mandurah. Our expertise ranges in areas such as Real Estate, Property Management, Hospitality and Catering. As residents of Preston Beach we also have the added advantage of being able to attend to requests within a short time frame. Whether you are an owner looking for someone to manage your accommodation bookings, clean your holiday home or as a traveller, find you the most suitable holiday accommodation, AHS will guarantee a professional service at all times. We have a wonderful selection of holiday homes to choose from, offering a range of affordable prices to suit everyone. Being able to bring your pet with you on holiday is a bonus and we can accommodate your furry friends too ! Aldemor Holiday Services works in conjunction with the Shire of Waroona by maintaining some of the public Shire buildings in Preston Beach such as the Golf Club, Beach Carpark and BBQ ablution areas. ? You will find several holiday homes on our website, which you can book directly online via our Accommodation Booking Calendar. Same day booking requests cannot be guaranteed, generally a 24hr advance notice period applies. We are only a phone call away ~ so give us a call now on 0412 800 985 or email aldemor.services@gmail.com?? 4 Bedrooms and 2 Bathroom House [ Daily rate starts at 6 guests ] Enjoy our hotel quality and professionally laundered bed linen and bath towels per stay. Doonas, pillows and extra blankets are also provided. The downstairs area of this comfortable and spacious double storey holiday home comprises kitchen/dining and TV/lounge/living areas, two double bedrooms (one with TV), both bathrooms and two toilets. Upstairs there are a further two bedrooms with a second TV lounge retreat area. For your convenience there is a second refrigerator in the laundry. Blue Tooth radio and DVD player is also provided. Please note that there are stairs to the house and also a paved pathway leading onto a ramp access to the front door entrance. Note that the rates displayed on WA Holiday Guide are a guide only and may not be 100% accurate. To obtain the most up to date accommodation rates, check what specials are available, make a booking or have a look at our gallery of photos please visit www.aldemorholidayservices.com. Contact Tracy on 0412 800 985 who will be happy to assist you with your enquiry. 3 Bedrooms and 2 Bathroom House [ Daily rate starts at 4 guests ] Relaxing by the beach could not be easier at Bonnie Dune in Preston Beach. Soak up the glorious ocean views from the decking area and watch the sun go down. Beautiful bathrooms (one with bathtub), modern appliances and elegant furniture throughout for you to enjoy a comfortable stay. Handmade Jarrah outdoor chairs ~ one of a kind in Preston Beach. Suitable for a romantic getaway or family vacation. You wont regret it ! Preston Beach is a comfortable 1.5hrs drive South of Perth between Mandurah and Bunbury - 10kms from the turn off at Forrest Highway. Note that the rates displayed on WA Holiday Guide are a guide only and may not be 100% accurate. To obtain the most up to date accommodation rates, check what specials are available, make a booking or have a look at our gallery of photos please visit www.aldemorholidayservices.com. Contact Tracy on 0412 800 985 who will be happy to assist you with your enquiry. 2 Bedrooms and 2 Bathroom Apartment in a Beach Resort [ Daily rate starts at 4 guests ] HEATED OUTDOOR SWIMMING POOLS, TENNIS COURTS, LICENSED CAFE/RESTAURANT, POOL BAR & GAMES ROOM, IN HOUSE FOXTEL TV. A classy refurbished, modern two storey beach shack situated on the beautiful grounds within Footprints Resort in the heart of Preston Beach. Only a hop skip and a few jumps to the resorts swimming pool and a very short stroll to the beach. DJs is a privately owned unit (separate from the Footprints Management) and managed by a local holiday accommodation business, readily available to assist you throughout your stay. Enjoy our quality and professionally laundered bed and bath linen per stay. Doonas, pillows and extra blankets are also provided in cooler months. The downstairs area comprises an equipped kitchen with microwave, dishwasher & other electrical cooking appliances. Open plan dining, lounge room (with sofa bed for two) provides access to the private BBQ decking and Alfresco area with a lovely bushland setting towards the street. Bedroom 1 sleeps two with an adjoining larger than normal ensuite bathroom with walk in shower, vanity and toilet (fully setup for wheelchair/disabled access). There is also a laundry nook with a washing machine and dryer combined. Upstairs you will find the master bedroom with a QS bed, built in wardrobe, a separate 2nd bathroom with walk in shower, vanity and toilet. Fancy a round of golf ? Prestons challenging golf course is just a 5min walk. Golf clubs available on request. Preston Beach is renowned for fishing, beach access for 4WD, swimming, 9 hole golf course, nature & wild life, located in the Peel Region of WA 1.5hr south of Perth between Mandurah & Bunbury. Note that the rates displayed on WA Holiday Guide are a guide only and may not be 100% accurate. To obtain the most up to date accommodation rates, check what specials are available, make a booking or have a look at our gallery of photos please visit www.aldemorholidayservices.com. Contact Tracy on 0412 800 985 who will be happy to assist you with your enquiry. 4 Bedrooms and 2 Bathroom House [ Daily rate starts at 8 guests ] Flutterbys is a modern, family retreat positioned in an undulating spot with a short 10 min walk to beautiful Preston Beach, 5min walk to the General Store & bottle shop for your basic provisions and cafe/dining nearby. Renowned for fishing, beach access for 4WD, swimming beach, 9 hole golf course, nature & wild life, located in the Peel Region of WA 1.5hr drive south of Perth. Enjoy our quality hotel style and professionally laundered bed linen and bath towels per stay. Pillow, doonas/Duvets and extra throws are provided. Complimentary milk, tea, coffee, hand soap, laundry detergent and toilet rolls. Note that the rates displayed on WA Holiday Guide are a guide only and may not be 100% accurate. To obtain the most up to date accommodation rates, check what specials are available, make a booking or have a look at our gallery of photos please visit www.aldemorholidayservices.com. Contact Tracy on 0412 800 985 who will be happy to assist you with your enquiry. 3 Bedrooms and 2 Bathroom House [ Daily rate starts at 4 guests ] Romantic getaways and luxury at its best by the sea. No expenses spared whatsoever at this beautiful private residence. There is even Foxtel to keep you amused ! Situated in a secluded cul-de-sac with bushland pedestrian access through to the Golf Club, Footprints Resort, General Store & our gorgeous Preston Beach. Preston Beach is renowned for fishing, beach access for 4WD, swimming, 9 hole golf course, nature & wild life, located in the Peel Region of WA 1.5hr south of Perth between Mandurah & Bunbury. Note that the rates displayed on WA Holiday Guide are a guide only and may not be 100% accurate. To obtain the most up to date accommodation rates, check what specials are available, make a booking or have a look at our gallery of photos please visit www.aldemorholidayservices.com. Contact Tracy on 0412 800 985 who will be happy to assist you with your enquiry. Sleeps 8 people (4 adults) Children are most welcome as long as the total occupancy does not exceed 8 guests. Please note that the upstairs decking area does not have fully enclosed railing therefore not suitable for toddlers. 3 Bedrooms and 2 Bathroom House Sorry, no pets allowed. [ Daily rate starts at 4 guests ] Pure relaxation, unwind and recharge ~ thats all you need to do when you stay at La Vista. So close to the beach, within 400m walking distance. Wrap around balcony and views from all the upstairs windows and decking area. Even the kitchen has a sea view ! Handwash the dishes or put them in the dishwasher - the choice is yours. Massive grassed areas (front and backyards) for the children to play. Sorry, no pets allowed. You will find a spacious double storey beach house with 3 bedrooms and 2 bathrooms. Note that the rates displayed on WA Holiday Guide are a guide only and may not be 100% accurate. To obtain the most up to date accommodation rates, check what specials are available, make a booking or have a look at our gallery of photos please visit www.aldemorholidayservices.com. Contact Tracy on 0412 800 985 who will be happy to assist you with your enquiry. 4 Bedrooms and 2 Bathroom House [ Daily rate starts at 6 guests ] Pet Friendly accommodation Oceanview is by far one of the most popular beach houses in Preston Beach and continues to provide families with memorable holidays by the sea. Situated in an elevated position just 400m to the beach where you can enjoy breathtaking ocean views and sunsets from the decking area. Relax and unwind when you check in at Oceanview. Offering 4 large bedrooms, 2 bathrooms, open plan kitchen/lounge/dining. Keep warm in Winter and cooled in Summer with reverse cycle airconditioning to the living area. Enjoy our hotel quality and professionally laundered bed linen and bath towels per stay. Doonas, pillows and extra blankets are also provided. Note that the rates displayed on WA Holiday Guide are a guide only and may not be 100% accurate. To obtain the most up to date accommodation rates, check what specials are available, make a booking or have a look at our gallery of photos please visit www.aldemorholidayservices.com. Contact Tracy on 0412 800 985 who will be happy to assist you with your enquiry. 2 Bedrooms and 2.5 Bathroom Townhouse in a Beach Resort [ Daily rate starts at 4 guests ] HEATED OUTDOOR SWIMMING POOLS, TENNIS COURTS, LICENSED CAFE/RESTAURANT, POOL BAR & GAMES ROOM, IN HOUSE FOXTEL TV. A classy well maintained, modern two storey townhouse situated on the beautiful grounds within Footprints Resort in the heart of Preston Beach. Only a hop skip and a few jumps to the resorts swimming pool and a very short stroll to the beach. Prestons challenging golf course is just a 5min walk. Enjoy our quality and professionally laundered bed and bath linen per stay. Doonas, pillows and extra blankets are also provided. All the facilities on the grounds of Footprints are made available for guest use when staying at PDs ~ such as the heated outdoor swimming pools, games room (with pool table), outdoor tennis courts and restaurant/cafe. There is even a function centre available for hire. The downstairs area comprises an equipped kitchen with microwave, dishwasher & washing machine, clothes dryer. Open plan dining, lounge/TV room (with two single sofa beds) provides access to the private BBQ decking and Alfresco area with a lovely garden outlook. There is a downstairs toilet and hand basin located on the back verandah. Upstairs you will find an airconditioned master bedroom with a KS bed and 2nd TV unit. Large open ensuite bathroom with walk in shower and double shower heads and hand basin. Step out from the Master Bedroom and enjoy your morning coffee on the balcony and watch the kangaroos pass by. The airconditioned 2nd Bedroom is also on this level with ensuite shower and hand basin. Separate toilet shared by both bathrooms. Free guest parking is available on the grounds. PDs is a privately owned unit (separate from the Footprints Management) and managed by Aldemor Holiday Services in Preston Beach, readily available to assist you throughout your stay. Preston Beach is renowned for fishing, beach access for 4WD, swimming, 9 hole golf course, nature & wild life, located in the Peel Region of WA 1.5hr south of Perth between Mandurah & Bunbury. Note that the rates displayed on WA Holiday Guide are a guide only and may not be 100% accurate. To obtain the most up to date accommodation rates, check what specials are available, make a booking or have a look at our gallery of photos please visit www.aldemorholidayservices.com. Contact Tracy on 0412 800 985 who will be happy to assist you with your enquiry. 6 Bedrooms and 2 Bathroom House [ Daily rate starts at 8 guests ] Pets considered upon application. Preston Family Retreat has double of everything ~ two houses under the one roof. Positioned a short 10 min walk to beautiful Preston Beach, a 5min drive to the General Store & bottle shop for your basic provisions and cafe/dining nearby. Renowned for fishing, beach access for 4WD, swimming beach, 9 hole golf course, nature & wild life, located in the Peel Region of WA 1.5hr drive south of Perth. Enjoy our hotel style and professionally laundered bed linen and bath towels per stay. Pillow, doonas/Duvets and extra throws are provided. Complimentary milk, tea, coffee, soap, laundry detergent and toilet rolls. Note that the rates displayed on WA Holiday Guide are a guide only and may not be 100% accurate. 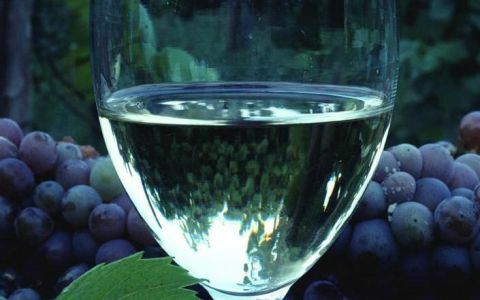 To obtain the most up to date accommodation rates, check what specials are available, make a booking or have a look at our gallery of photos please visit www.aldemorholidayservices.com. Contact Tracy on 0412 800 985 who will be happy to assist you with your enquiry. Sleeps 6 people (max 2 adults) 2 Bedrooms and 1 Bathroom Villa (Unit) [ Daily rate starts at 2 guests ] Step back in time with Retro Vista offering true 70s style accommodation in an elevated position at the front of other villas (complex of 30 units), overlooking beautiful Lake Preston, Yalgorup National Park where you can sit back and watch the ever changing scenery and wildlife go by. Off Street parking for one vehicle. Close to the beach, Golf Course, General Store & bottle shop for your basic provisions & Cafe dining at Footprints Resort. Preston is renowned for fishing, beach access for 4WD, swimming beach, 9-hole golf course, nature & wild life, located in the Peel Region of WA 1.5hr South of Perth. Enjoy our hotel quality and professionally laundered bed sheets and bath towels per stay. Doonas with covers, pillows and extra blankets are also provided in the cooler months. Complimentary milk, tea and coffee. Note that the rates displayed on WA Holiday Guide are a guide only and may not be 100% accurate. To obtain the most up to date accommodation rates, check what specials are available, make a booking or have a look at our gallery of photos please visit www.aldemorholidayservices.com. Contact Tracy on 0412 800 985 who will be happy to assist you with your enquiry. Sleeps 8 people ~ pets welcome 3 Bedrooms and 1 Bathroom House [ Daily rate starts at 4 guests ] Step inside and experience the funky, colourful, comfortable atmosphere of Shackadelic, one of Falcon Bays latest holiday houses. We think its pretty fancy for a holiday shack and hope you do too. Fully fenced front and backyard so you can bring your pet too ! 650m (7 minute walk) to the waters edge (Falcon Bay Beach), Falcon Bay Cafe, playgrounds, shops, restaurants/cafes, bottle shop & more. A short 5 minute drive to the Falcon Estuary for fishing and crabbing. Note that the rates displayed on WA Holiday Guide are a guide only and may not be 100% accurate. To obtain the most up to date accommodation rates, check what specials are available, make a booking or have a look at our gallery of photos please visit www.aldemorholidayservices.com. Contact Tracy on 0412 800 985 who will be happy to assist you with your enquiry. Sleeps 6 people (max 2 adults) Pet Friendly Accommodation 2 Bedrooms and 1 Bathroom Villa (Unit) [ Daily rate starts at 2 guests ] The Lodge is an affordable getaway in the beautiful seaside town of Preston Beach. Offering light and bright accommodation for couples or small groups. Located in a complex of other single storey units, overlooking beautiful Lake Preston and the Yalgorup National Park where you can sit back and watch the ever changing scenery. Lovely undercover outdoor patio/bbq area with views to the National Park. Reverse cycle airconditioning (heat/cool) to the kitchen/dining/living areas ensuring a comfortable stay. Enjoy our hotel quality and professionally laundered bed sheets and bath towels per stay. Doonas with covers, pillows and extra blankets are also provided. Off street parking next to the unit for two vehicles. Close to the beach, Golf Course, General Store & bottle shop for your basic provisions & Cafe dining at Footprints Resort. Preston is renowned for fishing, beach access for 4WD, swimming beach, 9-hole golf course, nature & wild life, located in the Peel Region of WA 1.5hr South of Perth. Note that the rates displayed on WA Holiday Guide are a guide only and may not be 100% accurate. To obtain the most up to date accommodation rates, check what specials are available, make a booking or have a look at our gallery of photos please visit www.aldemorholidayservices.com. Contact Tracy on 0412 800 985 who will be happy to assist you with your enquiry. 3 Bedrooms and 1 Bathroom House [ Daily rate starts at 4 guests ] Light and bright, tastefully renovated beach house set in a quiet location for your next seaside getaway. Fantastic undercover outdoor decking entertainment area where you can watch the wildlife go by. Gas BBQ and large outdoor table and chair setting with matching outdoor lounge chairs ~ ideal for family gatherings. Lounge, kitchen, dining, bedrooms, bathroom and 2 toilets all on one level. Preston Beach is a comfortable 1.5hrs drive South of Perth between Mandurah and Bunbury - 10kms from the turn off at Forrest Highway. Note that the rates displayed on WA Holiday Guide are a guide only and may not be 100% accurate. To obtain the most up to date accommodation rates, check what specials are available, make a booking or have a look at our gallery of photos please visit www.aldemorholidayservices.com. Contact Tracy on 0412 800 985 who will be happy to assist you with your enquiry. Please contact us for our cancellation policy/terms and conditions. 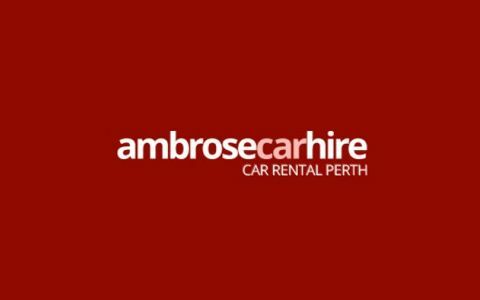 Located approximately 1 hour 30 minutes South of Perth between Mandurah and Bunbury. This cute little villa is comfortable and 'homey'. We just loved our short stay, particularly the kangaroo and parrots that came to the back door, the kids were able to feed them some apple which was super cool!! The villa is groovy, clean and has everything you need. Tracy is efficient, reliable and friendly and if we plan to visit again will definitely touch base"
My 100 year old Mother & I stayed at Peppermint Cottage in Falcon, Mandurah in late June this year - we both greatly enjoyed our 5 day stay, finding everything quite comfortable as a base 4 such activities as taking a "dolphin- spotting" cruise on the harbour & trawling through local antiques outlets. Although told she was not meant to do any work while we were away, my Mother gravitated 2wards the kitchen, finding it quite easy 2 use in making us a couple of light meals during that week. 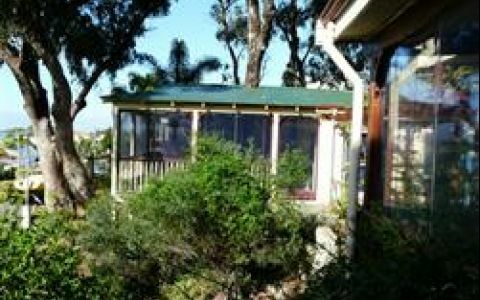 While we missed the superb views we used to have from holiday accommodation in Caloundra Qld where we stayed in previous years, we still found the bushland setting at Peppermint Cottage very relaxing. Tracy, from Aldemor was very responsive 2 all our queries, & I appreciated her referring us 2 1 of the antique outlets in Waroona where I bought some items & have since called its proprietors 2 buy yet another from them.